Occupational Therapy (OT) is an allied health care profession established more than 85 years ago. It addresses problem of differently able persons and uses specific intervention procedures and activities to restore lost function, compensate for disability and promote health and wellness. It steps beyond the 'prevention and cure' mantra to the maximize independence of the individual. It focuses on recuperation, giving confidence to people whose disability may be caused by a stroke, a mental illness, a physical and mental weariness because of cardiac or other illnesses or even a hereditary deficiency. want to and are expected to do. It is a profession dedicated to helping people achieve well-being through occupation. The term “occupation” represents the flow of activities that fill a person's life and that have an effect on his or her health. Occupational therapy is particularly concerned with how people construct meaningful lives individually and in community. It is dealing with both physically and mentally ill persons. Occupational therapy uses the day to day activities of work, self care, leisure and play to enhance development of skills and possibilities. It may include adapting the work or environment as per the present abilities of the client, to achieve maximum independence and to enhance the quality of life. It is the job of an Occupational Therapist to figure out which areas are affected and how he can assist that person in performing these activities in a more functional and successful way. Occupational Therapists can work with normal as well as disabled, children as well as aged people. Occupational therapy has started treading path in the new areas like Industrial rehabilitation & ergonomic interventions also. The faculty & staff in the Department of Occupational Therapy of the Institute are primarily involved in teaching, research and services to the persons with disabilities. The therapeutic services to the patients are given through indoor, outdoor & outreach services, teaching / training and research etc. This section consists of tools, apparatus, equipments and other useful gadgets for occupational therapy treatment of patients above 12 years of age. On an average, 70 to 80 patients/persons suffering from neurological or orthopaedic problems are being attended every day. It includes new cases as well as cases for follow up therapy. These sanding units are available in different forms and are used for the treatment of patients with physical impairments like frozen shoulder / peri-arthritis, paralytic / weak upper limb(s) stiff joint(s), or other such diseases/ disabilities /deformities of upper limb. These units are available in different shapes, sizes, contour, weights, colour and sets with different parameters used for comprehensive functional testing and therapy of hand in the department. This equipment is used to improve range of motion, muscle power, muscle tone , co- ordination , and other functional aspect of Upper Limb. This gadget is mainly used to improve / develop functional status of upper extremity and to increase joint range of motion of upper extremity specially shoulder and forearm. This gadget is mainly used to develop standing tolerance and prevention of Ortho-kinetic hypotension in neurological cases i.e. stroke and Spinal cord injuries patients. This is an electrically operated gadget used to increase passive range of motion usually in Orthopaedic cases. Some other gadgets which are used in the department are Wrist Mobilizer, Shoulder Pulley, Finger ladder, Pronation- Supination Machine, Rowing Machine, Pedo-cycle, Normal Finger table etc. which are used to mobilize different joints of upper extremities. This is an important modified equipment / bi-cycle which works mainly for the functional improvement of lower and upper extremity simultaneously along with eye hand coordination and is of great vocational value. This is used for the purpose of joint mobilization and muscle strengthening of lower extremity. These are specially designed heavy weight balls of various dimensions. These are used to mobilize ankle joints and strengthening of foot muscles. Specially designed, this cycle helps to strengthen the muscles and increase ROM especially of lower extremity. Other gadgets which are used in the department are Trunk rotator, Foot rocker board, Ankle foot exerciser, Rocker boards, Peg boards, Tic-tac -toe. These gadgets are used to improve, maintain, develop, joint Mobility Power, Range of motions, joint mobility coordination, balance and other functional aspects of lower limbs. This gadget is mainly used by Occupational Therapist to improve functional status of upper extremity. The children from the age group of two year to seven year are usually provided this activity. This gadget is mainly used to improve and maintain co-ordination prehensions, grip / strength, range of motion , eye hand co-ordination and such other factors of upper extremity. This equipment is used mainly to improve and maintain joint mobility, muscle power, range of motion (ROM), grip, Prehensions and functional status of upper extremity. These gadgets are used for the purpose of training and facilitating of balancing, standing and walking activities in children affected with diseases like Polio, C.P., and Infantile hemiperesis etc. These equipments are used to develop and promote performance areas of lower extremity. Vestibular board, Rocker board, Peg boards, Mats, Crawler, Wedge board and such other equipments are used for the purpose of Therapy / Treatment in Occupational Therapy. This is an important area of Occupational Therapy intervention. Here the clients are given training for the activities of daily living with the help of different gadgets in simulated forms. This unit uses different types of tools, apparatus, equipments and other useful gadgets are used by this unit for the training of Occupational Therapy. These are designed by Occupational Therapists as per requirement of the case / client / patient according to their need / prescription. This unit deals with patients who have already been rehabilitated and need to develop/ increase their stamina / endurance, control their speed during work, coordination in work, tolerance, performance areas. The clients with disabilities having Hemiplegia, Paraplegia, Monoplegia, Cerebral Palsy, Post Polio Residual Paralysis, Neuropathies, Myopathies, Head Injury, Osteoartritis, Periarthritis, Cervical spondylitiis, Lumber spondylitis, Post Fracture Joint stiffness Amputation, Congenital abnormalities, Down syndrome, Autism, Mental Retardation etc. are being provided therapeutic intervention. The department has been involved in establishing an in house training centre for persons with disabilities at Rashtrapati Bhawan Estate in collaboration with Kalyan Kendra. There are 23 children/adult with disabilities which are being provided therapeutic management. The Department is also involved in assisting outreach services in the Institute in different parts of the country. 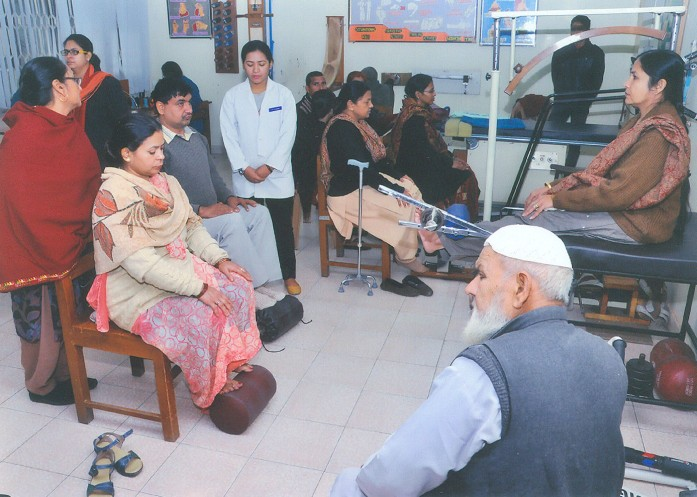 The Occupational Therapists also engaged in Rehabilitation Camps, Mela, Trade Fair and Exhibitions in the country as and where needed. The Therapists of the department extended their full support and cooperation in the organization of National Awards 2013. The department is known to produce high level therapists and imparting training to them who have the capacity to be employed in country and abroad. The group of dedicated teachers of the Institute is responsible for imparting intensive teaching and training to the students and medical professionals from the collaborating medical colleges and rehabilitation centres. The course is being run by the Institute in affiliation with University of Delhi. The Occupational Therapy Department of the Institute has started placement service for its students. For this purpose the department have requested different organizations to provide placement to their students. Some of the organizations have requested for providing the list of internees and the students who have pass their respective degrees to offer suitable job to them. The Institute is committed to upgrade the faculty and staff of the Institute. In this regard Institute permitted two of its Occupational Therapists to complete their doctoral degree in Occupational Therapy. Both of them have completed their doctorate. Four of our faculty members have their Post Graduate Degree in Occupational Therapy (MOT) in first class. One more faculty member is pursuing Post Graduation in Occupational Therapy. Effectiveness of Mirror Therapy on motor recovery of upper extremity in chronic stroke patients. May 2013 to March. (Principal Investigator: Dr. Kamal Narayan Arya, Co-PI: Shanta Pandian). Motor impairment of the ipsilesional body side in post-stroke subjects. Journal of Body work & Movement therapy (Elsevier): 2013 Oct;17(4):495-503.